The Centers for Disease Control and Prevention report that only 19 percent of teens are active in physical education classes across the country. 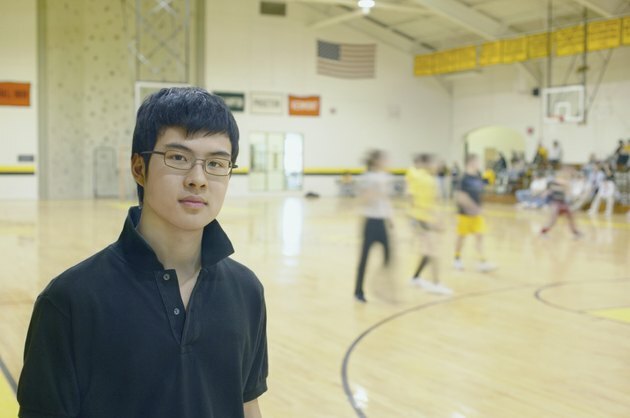 Some teens simply don't participate in class, while others opt out entirely when P.E. is an elective. To entice more teens to come to and actively participate in P.E. class, games and activities should be employed that create a positive association between physical activities and teens. Gymnasium games are used year-round to create healthy habits. When you have a large P.E. class, there's often more time spent sitting on the sidelines than actually playing certain sports because of rules and regulations. Look for ways to modify sports to encourage more participants on the court. Four square volleyball is played by setting up two intersecting volleyball nets and creating teams of five or six for each square. The game is played by hitting the ball over any net. Each team has three strikes where the ball is allowed to hit the ground, after which they sit and the game continues with the remaining team. The last team standing is named the winner. Fitness tests are often a staple at the beginning and end of each semester in P.E., helping to measure a teen's success. But the tests are boring and strenuous. Make the test more like a game to increase participation and teamwork. By turning the test into a relay for teams of four or five, the competition increases. Set up various stations around the gym for running, a defined number of crunches, shooting and other tests. When you blow the whistle, the first team member moves through the stations, completing each test for speed and accuracy. Once one teammate has made it through the tests, the next teammate proceeds and so on, with all teams competing for the best time. The human knot exercise is simple and doesn't require special equipment, making it an excellent time-killer or getting-to-know-you game for new students. All of the teens stand in a circle. When you give the cue, each grabs the right hand of another person. Then, the left hand is deployed for the same purpose. The knot is then untangled by the hands remaining clasped as the students, duck, twirl and step to come back to their starting position. Time the knot for added excitement. Boccer, a mix of basketball and indoor soccer, helps sharpen basic skills while making the game more interesting with new rules. Set an indoor soccer goal underneath each basketball net and name a goalie. Then, separate into teams and begin playing indoor soccer. The ball is handled using the feet only unless it's kicked in the air and caught before it hits the ground, when hands are used. Players can only take two steps at a time and cannot dribble. If the ball is in hands, it's shot at the basketball net. If the ball is on the ground, it's shot at the soccer net. First team to 15 points, with each goal counting for one point, is the winner.